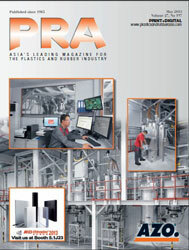 The global market for methyl methacrylate (MMA) -- a chemical critical to the production of plastics, paints, coatings and adhesives for a host of consumer markets -- is increasing significantly, while supply continues to be constrained due to production shutdowns and operational issues at ageing production facilities, according to new chemical research from IHS Markit. MMA is essential for the production of a diverse range of consumer products, including automotive plastics, TV and electronics screens, optical devices, dental and orthodontic products, signage, lighting, windows, and household acrylic paints, coatings and adhesives. The primary application for MMA, which represents approximately 50% of global demand, is as a feedstock for production of polymethyl methacrylate (PMMA). PMMA is a key plastic used in a host of applications, including acrylic glass or “safety glass,” often known by trademark names such as Plexiglas or Lucite. The second largest application is for production of paints and coatings, which consume about 40% of global MMA demand, IHS Markit said. Currently, according to the “IHS Markit Global Acrylates and Super Absorbent Polymers (SAP) Market Advisory Service” global demand for MMA through 2018 is expected to reach 3.7 million tonnes, and by 2023, demand for MMA will exceed 4.3 million tonnes. 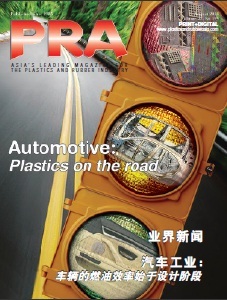 Much of this increased demand is due to growing demand for coatings and adhesives in China and elsewhere. Global demand growth will average slightly more than 3% during the next five years, with more mature, primarily western, markets growing at up to 2% during that time period. China, which is a developing economy, is growing at 4.5% per year, IHS Markit said. MMA prices in China have been steadily increasing during the last 18 months, reaching just under US$2,900-tonne, according to the IHS Markit report. In Western Europe and the US, producers also benefited from higher prices during the same period. European prices increased nearly 60% since January 2017, to US$3,058-tonne (delivered). Prices increased nearly 20% in the US during the same period. 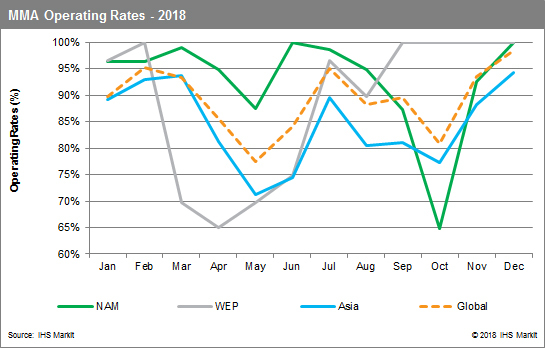 Poussin expects a cluster of further planned shutdowns in September and October, both in Asia and in the US, will result in a second dip this year in operating rates and constricted supply. Available MMA capacity in the US will drop to 65%, while Northeast Asia capacity will fall 80% during the period, according to IHS Markit. This tightness will lead to price hikes as companies seek to add volume through internal transfers, swaps, or the merchant market. 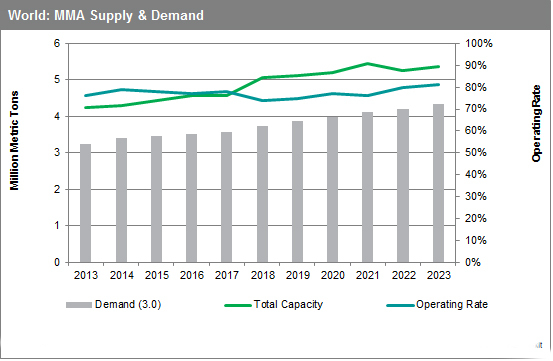 Newly built capacity will not be sufficient to cover the supply gap caused by maintenance shut-downs late this year, the IHS Markit report said. Poussin said two new facilities have been commissioned this year in the Middle East, but their added production has had a minimal impact on the market this year and will not be sufficient to cover 2018 production losses due to maintenance shut-downs. One of those plants, the Saudi Methacrylates Company, is a joint venture between Mitsubishi Chemical Corporation and Saudi Basic Industries Corporation known as SAMAC, and began operation earlier this year in Jubail Industrial City in Saudi Arabia. The Jubail SAMAC facility has a capacity of 250,000 tonnes/year. Its accompanying intermediates plant is currently producing 40,000 tonnes/year of PMMA, IHS Markit said. The second MMA plant built in the region is Petro-Rabigh’s 90,000 tonnes/year unit, located in Rabigh, Saudi Arabia. Petro-Rabigh also has an accompanying 50,000 tonnes/year PMMA plant in Rabigh, which opened this spring. MMA is a key driver for the consumption of other chemicals. Roughly one-fourth of global acetone production is used to produce MMA, so MMA is a significant contributor to downstream chemical consumption, the report said. Acetone, however, has been relatively expensive in western markets due to pricing it against what most in the industry think of as its feedstock. A longer-term issue for MMA production is that MMA demand derived from the traditional acetone cyanohydrin route is static due to the fact that it requires hydrogen cyanide (HCN) as feedstock and there are scale limitations, Poussin said. Newer technologies, such as the Alpha C2 process from Lucite International, the world’s largest producer of MMA, offer an ethylene route to MMA production, avoiding the need for cyanide. Additionally, it offers a tremendous feedstock cost advantage to U.S. producers who have access to the country’s large volumes of inexpensive ethylene production. Not only does the ethylene process offer cheaper raw materials for production of MMA, but also economies of scale, particularly for producers in the US and the Middle East, IHS Markit said. Evonik Industries, the second-largest MMA producer behind Lucite International, has developed a technology that uses ethylene to produce MMA, but the company has not yet “proven” it with a new unit. The company announced earlier this year it was evaluating all options for future development of its MMA business, and a possible sale of its assets could encourage a new investor or shareholder to invest in a new MMA unit, IHS Markit said. “Many of the world’s MMA plants are a few decades old, so the industry is overdue for new capacity investments and with increasing environmental and sustainability regulations facing the industry, more producers are interested in newer technologies that avoid the cyanide route,” Alvarado said. “These newer methods not only offer health and safety benefits of avoiding an extremely hazardous chemical, but also capture the feedstock cost benefits of plentiful ethylene supplies that exist in the US,” Alvarado said. According to IHS Markit Process Economics Program (PEP) MMA reports, the two newer ethylene-based processes take different reaction routes to produce MMA. In the Lucite process, ethylene reacts with carbon monoxide and methanol to produce methyl propionate, which then reacts with formaldehyde to form MMA by removing water. In the Evonik’s new LiMA process, ethylene reacts with hydrogen and carbon monoxide to produce propionaldehyde, which in turn reacts with formaldehyde to form methacrolein (MA) by removing water. MA further reacts with air and methanol to produce MMA. Other than the acetone (C3) and ethylene (C2)-based processes mentioned above, MMA can also be produced by isobutylene or tertiary butanol (C4)-based processes. “These options make MMA production very interesting from a process technology viewpoint,” said RJ Chang, Director of chemical process technology research at IHS Markit, and an author of the IHS Markit Process Economics Programs on MMA technologies. “The competitive production economics is highly dependent on the relative price of C2, C3, and C4 feedstocks in each region. To make sound investment decisions, a company needs to take into account feedstock availability in each region and price fluctuations during the investment period,” Chang said.